A few months ago I made a delicious Buffalo Chicken Lasagna. I wanted to try and re-create that recipe by making it in muffin tins so that it would be more portion control/calorie friendly. They were just as good if not better than the orginal recipe! Pre-heat the oven to 375. Lightly mist a 12 cup muffin tin with cooking spray and set aside. In a small bowl combine ricotta, garlic powder, and half cup of the cheese. In another bowl combine wing sauce and chicken. 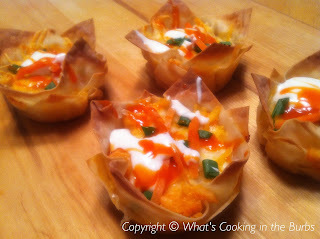 Push a wonton wrapper into the bottom of each of the 12 sprayed muffin cups. Using about half of the ricotta mixture, spoon evenly into the wonton wrappers. Follow by spooning some of the chicken. Sprinkle the remaining shredded cheddar jack evenly over the top of each cup. Press another wonton wrapper on top and repeat the layering steps with the remaining ingredients. Bake for 18-20 minutes or until golden brown. Let cool 5 minutes before removing from muffin tin. Enjoy! These look really good! I always have wonton wrappers I need to use up :) New follower, saw you on Whimsy Wednesdays! Oh my, this looks delicious! I have pinned it so I am sure to find this recipe again when I need it. The recipes doesn't say what to do with the Buffalo Wing Sauce. Do we toss the chicken in it? Drizzle it on top? Oh gosh, I'm so sorry. You mix the wing sauce with the chicken and you can drizzle extra on top. It looks really great and your idea it's brilliant. Good Job!